JK Rowling revealed1 on twitter that Newt Scamander got expelled from Hogwarts. Dumbledore was a young teacher at the time Newt was expelled. He wasn't able to revoke expulsions. Upon graduation from Hogwarts School of Witchcraft and Wizardry, Mr. Scamander joined the Ministry of Magic in the Department for the Regulation and Control of Magical Creatures. There really should be no way to miss that fact considering how J.K. Rowling's lawyer has said (under oath) that this is a small book. For example, the evidence will show that there are 274 entries in the Lexicon pulled from Ms. Rowling's 64-page Quidditch Through The Ages book. I'm holding it up, your Honor. It is not a very big book and they have 274 entries about it alone. Similarly, in her 63-page book, Fantastic Beasts and Where To Find Them, there are 222 Lexicon entries pulled from this book. How did Newt Scamander graduate from Hogwarts if he got expelled? 1 In as much that the movie isn't a reliable canon source. The tie-in book The Case of Beasts: Explore the Film Wizardry of Fantastic Beasts and Where to Find Them contains the following article which relates to Newt's supposed crimes. A closer inspection reveals that Newt was indeed formally expelled, but that his expulsion was never "enforced" (whatever that means). This presumably includes allowing him to graduate and to keep his wand. NOTES: Proposed expulsion from Hogwarts School of Witchcraft and Wizardry due to the illegal possession of a magical beast causing endangerment of human life and violation of animal welfare laws 101/304. Punishment: Expulsion from Hogwarts School of Witchcraft and Wizardry. The expulsion was never enforced - Hogwarts Professor Albus Dumbledore defended Newton resulting in his name being cleared. The Ministry of Magic Animal Welfare Department were also informed of the violation and required to rehouse the magical creature. This is probably just a case of Rowling retconing a minor fact where she felt it would improve the story. It remains to be seen if the upcoming "expanded edition" of Fantastic Beasts will change that line. He returned later to finish his degree. @Potterish: @jk_rowling but we also know that Dumbledore has come to defend him. So, was the expulsion revoked? :) @JK_Rowling: Dumbledore was a young teacher at the time Newt was expelled. He wasn't able to revoke expulsions. 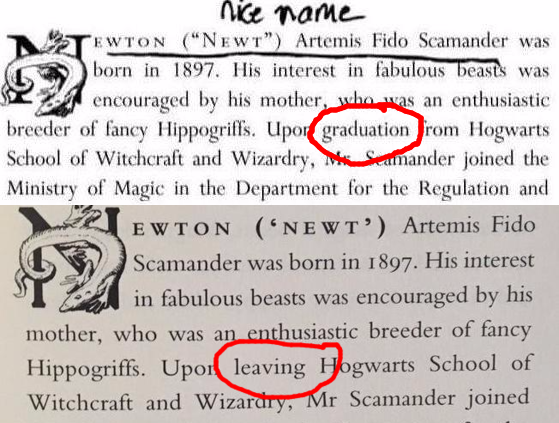 It's possible that he only went back after redeeming himself through the publication of Fantastic Beasts, and the graduation fact was added in later editions. It was an error that Obscurus books never picked up apon, even though the book is in it's fifty-second edition. 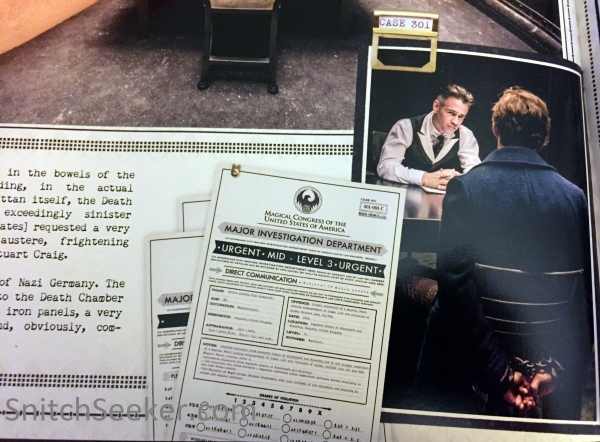 Mr. Scamander’s work with the Dragon Research and Restraint Bureau led to many research trips abroad, during which he collected information for his worldwide best-seller Fantastic Beasts and Where to Find Them, now in its fifty-second edition. Obscurus books blurred the truth for political reasons or to better sell the book. He was expelled in his sixth or seventh year, after having already received his O.W.L.s. Lots of these ideas were inspired by comments from Jonah, ThruGog, and Pwassonne. 2001 Edition: Upon graduation from Hogwarts School of Witchcraft and Wizardry, Mr. Scamander joined the Ministry of Magic in the Department for the Regulation and Control of Magical Creatures. 2017 Edition: Upon leaving Hogwarts School of Witchcraft and Wizardry, Mr. Scamander joined the Ministry of Magic in the Department for the Regulation and Control of Magical Creatures. There's nothing to say you can't go back. Hermione went back after going to hunt horcruxes with Harry. Furthermore, Hagrid was expelled and became a teacher. And we all know rules can change, like how Harry got a broomstick and became the youngest seeker in a century. "That's a broomstick," he said, throwing it back to Harry with a mixture of jealousy and spite on his face. "You'll be in for it this time, Potter, first years aren't allowed them." Not the answer you're looking for? Browse other questions tagged harry-potter hogwarts jk-rowling continuity fantastic-beasts or ask your own question. What does it take to be expelled from Hogwarts? Will there be a Fantastic Beasts and Where to Find Them novelization? Does this version of Fantastic Beasts and Where to Find Them contain images throughout?